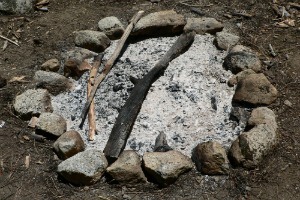 I have discovered several ways to use wood ash. 1. You can make a dust bath area in the henhouse for the hens. They love it and it keeps the mites off them, as well as providing needed minerals . They will not be losing feathers due to mites or mineral deficiency. 2. You can use the finely sifted ash to keep bugs off your garden plants. It also adds minerals to the plants . 3. Sprinkle some around the tomatoes to keep cutworms away. 4 Filter the ash by pouring water through the ash and straw and collect it in a bucket. This can be added to oil or many different fats to make lye soap. You can add sage, rosemary, mint or lavender to make different soaps. 5. In a grid down situation, you can use it in the outhouse in place of lime as a drying agent to keep down smells . It can also be used to cover a dead animal that is beyond being moved . It helps prevents the spread of disease. 6. Hide tanners use the lye made from ashes to tan hides. 7. The ashes can be used as a desiccant for keeping seeds dry. 8. A lye made from ashes is used for processing corn called nixtamalization. Nitxamalizing corn makes it easier to grind, more flavorful, and more nutritious.